At present, no basic number can be identified for the family as a whole. In general, the basic numbers are moderately high, ranging between n = 8 and 17. The lowest number found so far is n = 4 (Henckelia pumila), the highest is n = 64 (Streptocarpus hildebrandtii). The following arrangement of the subgroups of Gesneriaceae is according to the classification of Weber et al. (2013). For chromosome number details of the genera and species, see the webpage Möller & Pullan “WebCyte2” (2015 onw.) (see also section Genera and Species in Detail). Tribe Coronanthereae (“Coronantheroid Gesneriaceae” sensu Weber 2004; identical with traditional tribe Coronanthereae): In this small group generally high numbers are found, ranging from n = ± 37 to n = ± 45, and apparently due to (paleo)polyploidy. Subtribe Coronantherinae: From the two genera, Coronanthera and Rhabdothamnus, only the chromosome number of the latter is known: n= 37, 2n = ± 74. Subtribe Mitrariinae: From the four genera included, the chromosome number of Mitraria and Sarmienta is 2n = ± 74, that of Fieldia is = ± 80. Subtribe Negriinae: From the three genera included, only the number of Negria is (roughly) known: n = ±45, 2n = ± 90. Tribe Beslerieae (part of the “Gesnerioid Gesneriaceae” sensu Weber 2004): Ridiculously, for this large and significant group, comprising 9 genera and some 250 species (most of them belonging to Besleria), only chromosome counts for 2 species (of Besleria) are known: n = 16. This number is quite different from that found in other neotropical Gesneriaceae (tribe Gesnerieae, see below) and supports the separation of Beslerieae from this group. Tribe Napeantheae (part of the “Gesnerioid Gesneriaceae” sensu Weber 2004): This group includes only the genus Napeanthus with over 20 species. No chromosome numbers are known. Tribe Gesnerieae (part of the “Gesnerioid Gesneriaceae” sensu Weber 2004). In this significant group 5 subtribes have been recognized by Weber et al. (2013), all corresponding to traditional tribes. The probable base numbers are n = 13 (Gloxiniinae, Ligeriinae), and n = 9 (Columneinae). It has been suspected in the literature that the latter number is also derived from n = 13. Subtribe Gloxiniinae: This group, comprising 21 genera, is largely characterized by the chromosome number n = 13. Lower numbers (Eucodonia, Smithiantha: n =12, Achimenes, Moussonia, Niphaea, Pearcea: n = 11, Solenophora: n = 10) are probably due to descending dysploidy. Subtribe Sphaerorrhizinae: This comprises only the genus Sphaerorrhiza. The chromosome number is not known for either of the two species. Subtribe Columneinae: In this large group, corresponding to traditional tribe Episcieae and comprising 24 genera, the number is n = 9 almost throughout. Only two genera have n = 8, which number has been apparently reached by descending dysploidy. Subtribe Ligeriinae: This group corresponds to traditional Sinningeae and comprises Sinningia and two allied genera (their justification is under discussion). Almost all counts available read n = 13, only for Sinningia tubiflora and particular cultivars of Sinningia speciosa the number n = 14 has been reported. Subtribe Gesneriinae: All genera have n = 14, except Bellonia (n = 13). It is not clear what this means phylogenetically. As Bellonia with its secondarily actinomorphic flowers is advanced, its chromosome number may have been reached by loss of a chromosome (descending dysploidy). But the opposite view is also conceivable: Bellonia may have preserved the number n = 13 as found in the Gloxiniinae and Ligeriinae, and the number n = 14 has been reached by ascending dysploidy. Tribe Epithemateae (“Epithematoid Gesneriaceae” sensu Weber 2004): This group is heterogenous with regard to chromosome numbers, not only as to the genera, but also as to the species within some genera. The lowest number is n = 8 (Whytockia, Epithema p.p. ), the highest is n = 27 (Rhynchoglossum papuae, R. omeiense). Subtribe Loxotidinae: This comprises only the genus Rhychoglossum. For its species the numbers n = 10, 18, 21, and 27 have been reported. Subtribe Monophyllaeinae: This subtribe includes two genera that differ in the chromosome number. Whytockia has 2n = 18, Monophyllaea is somewhat variable, displaying a range from n = 10 (most counts) to 12. The highest number is found in the apparently dys-tetraploid M. horsfieldii: n = 16, 2n = 32. Subtribe Loxoniinae: From each of the two genera, Loxonia and Stauranthera, the chromosome number of one species has been reported: n = 22, and n = 18-20, respectively. Subtribe Epithematinae: Though the more than 20 species of Epithema (the only genus in the subtribe) are very much alike, there is considerable variation in the chromosome number. The following numbers have been reported for two species: n = 8, n = 9, 2n = 16, 2n = 18, 2n = 24, 2n = (24-) 26. Subtribe Jerdoniinae: For the single species of the subtribe, Jerdonia indica, the number n = 14 has been reported. Subtribe Corallodiscinae: Two numbers have been published for the type species of this monogeneric group: n = 10 (2n = 20) and 2n = 40. Subtribe Tetraphyllinae: Monogeneric with Tetraphyllum. No chromosome number is available. Subtribe Leptoboeinae: This subtribe, comprising ca. 6 genera, seems to be based on x = 10. Some counts are uncertain, Platystemma is apparently a tetraploid with n = 20. Subtribe Ramondeae: This small tribe, comprising 3 genera is quite variable: in Haberlea rhodopensis 3 different numbers have been reported: 2n = 39, 44 and 48. While Ramonda myconi and R. nathaliae have n = 24 and 2n = 28, respectively, for R. serbica the numbers n = ± 36 and 2n = ± 96 have been reported. Jancaea has again a different number: 2n = 56. The differences underline the high phylogenetic age of the three relict genera found in southern Europe. Subtribe Litostigminae: This is monogeneric with Litostigma. The chromosome number is not known for either of the two species. Subtribe Streptocarpinae: This subtribe comprised 9 genera (all distributed in Africa and Madagascar) in the classification of Weber et al. (2013). In the new definition of Nishii et al. (2015) Strepocarpus was enlarged to include the 8 remaining genera. Thus subtribe Streptocarpinae is now monogeneric with Streptocarpus. The genus can be divided into two subgenera, Streptocarpella and Streptocarpus. This division, suggested by the molecular data, conforms well to the chromosome numbers: subg. Streptocarpella is characterized by n = 15, subg. Streptocarpus by n = 16. Polyploidisation seems to play a major role in the speciation. Remarkably, in the twisted-fruited species (Streptocarpus in its traditional sense) polyploid species (tetra- and octoploid, n = 30, 32, 48, 64) are only found in Madagascar and the Comoro Islands, while the species on the African mainland remained on the diploid level. Subtribe Didissandrinae: This group comprises two genera: Didissandra and Tribounia. From the altogether ca. 10 species, only the chromosome number of Didissandra frutescens is known: 2n = 20. Subtribe Loxocarpinae: The group has been recently revised by Puglisi et al. (2015) and comprises 15 genera with over 200 species. For about half of the genera chromosome numbers are known. The numbers n = 9 (2n = 18) predominate, but there are also numbers such as n = 8 (2n = 16), n = 16, 17, 18 (for instance, all three found in Paraboea). Subtribe Didymocarpinae: Not unexpectedly, this very large group, comprising around 30 genera, is diverse with respect to chromosome number. Also not unexpectedly, some genera are heterogeneous. However, the largest genus, Cyrtandra, with perhaps 600 species, is remarkably uniform (n = 17, the few reported exceptions are doubtful). Other genera with a single number include Agalmyla (n = 16), Ridleyandra (n = 17) and Petrocosmea (n = 17). In a number of genera two or several basic numbers are found in one genus, evidently due to ascending or descending dysploidy (e.g., Aeschynanthus: n = 14, 15, 16; Didymocarpus: n = 11, 12, 14, 16, 18). Polyploidisation has obviously played a major role in the evolutionary diversification of Aeschynanthus. In this genus polyploidy (tetra- to octoploidy) is not only characteristic of particular species, but different ploidy levels even occur within individual species, e.g., A. parvifolius and A. ellipicus. In the latter species even three different ploidy levels (2x, 4x, 6x) have been reported. As far as is known, in these species the diploids and polyploids cannot be distinguished morphologically, and polyploidisation may be the first step of speciation. 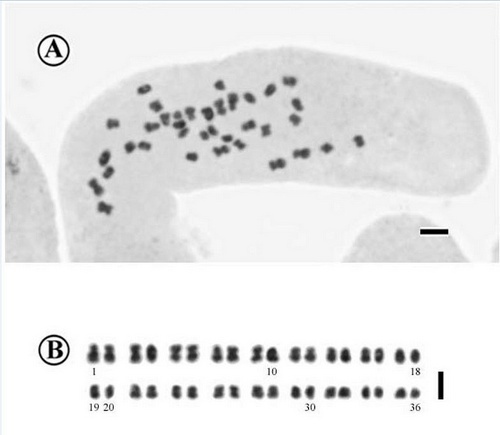 Illustration of chromosome counting: Microphotograph of chromosomes of Primulina cardaminifolia (A), and the chromosomes arranged by length (B). There are a total of 36 chromosomes arranged in pairs, hence 2n-36. From Wei-Bin Xu et al, 2013. In general, the chromosomes of Gesneriaceae are very small. They measure usually less than 1 mm in mitotic metaphase. Larger chromosomes have been found only in Agalmyla, Monophyllaea and Whytockia, measuring up to 3 mm.